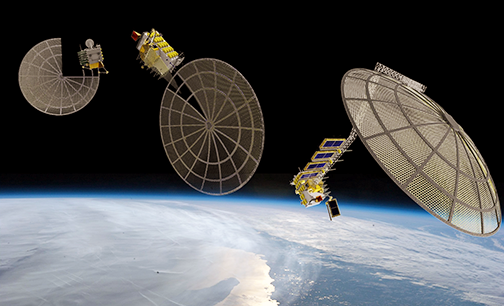 Made In Space, Inc. is developing power systems for smallsats that will provide large satellite power, which, in turn, enables smallsats to provide large satellite capability. Current smallsats are typically constrained to 1 kilowatt of power or less. The power system being developed by Made In Space can, initially, provide up to five kilowatts of solar power and is enabled by the company’s Archinaut in-space manufacturing and assembly technology. Archinaut-based solar array systems use space-manufactured structures and robotically assembled state of the art solar cell blankets to provide as much as 20 square meters of solar array for smallsats that launch from ESPA rings or small launch vehicles (in the 150 to 300 kg class). Three-stage artistic rendition of Archinaut assembling a satellite platform much larger than itself. Image is courtesy of Made In Space. The Archinaut power system is now possible due to the advancements in additive manufacturing and robotics Made In Space has accomplished over the last decade. 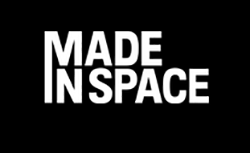 Made In Space has been using additive manufacturing on the International Space Station since 2014, operating multiple generations of manufacturing systems on orbit and building over 150 objects in space. The company’s extended structure additive manufacturing technology (ESAMM) is crucial to efficient in-space manufacturing and assembly operations due to its ability to make structures significantly longer than itself, or the accompanying robotic systems. In 2017, this technology won a Guinness World Record for the longest 3D printed structure measuring at 37.7 meters. ESAMM was successfully operated in a thermal vacuum chamber simulating the Low Earth Orbit environment. 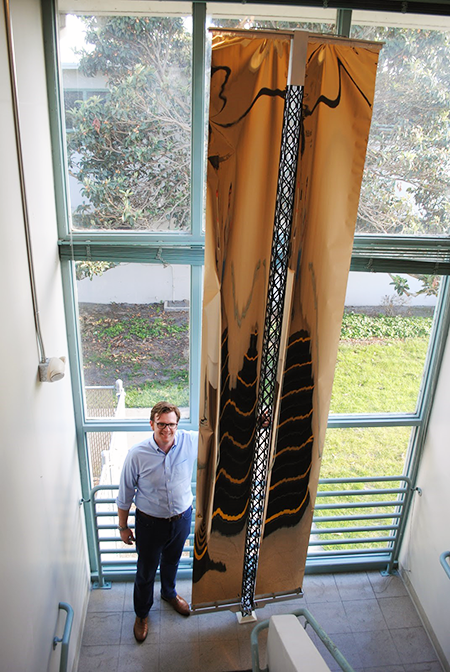 The Made In Space solar array for smallsats — company CEO Andrew Rush demonstrates the size of the array. Photo is courtesy of Made In Space. Archinaut’s power system is expected to enable many large satellite applications on smallsats. Whether it’s a commercial company seeking to get to market quicker, a defense group upgrading its assets more rapidly, or scientists striving to deploy Moon mapping systems for future human exploration missions, reducing development time, build cost, and launch cost is valuable. Archinaut’s power system can also operate as a standalone system integrated into larger satellite buses, gaining more efficiency in larger systems. For example, preliminary studies indicate that a 500 kW Archinaut power system using modern solar cell blankets requires 2,000 m. of solar array surface area and has a system mass of 1,000 kg — more than an order of magnitude less mass than systems currently on orbit. For comparison, the International Space Station’s (ISS) eight solar array wings have a total area of roughly 2,500 meters with a system mass of 65,000 kg. Andrew Rush, the CEO of Made In Space, said that these systems enable power intensive payloads to be deployed to space at a fraction of the cost of larger satellites, with no sacrifice in power provisioning, Despite advances in avionics and payload packaging, small satellites provide less capability per kilogram than their larger brethren because small satellites are power constrained. This often prevents power intensive science, remote sensing, communications, and defense payloads which otherwise fit. Deploying these power intensive payloads on smallsats is game changing as these platforms costs an order of magnitude less to build and launch and can be fielded much more rapidly than 1,000+ kilogram satellites. The technology risk is very low — the core additive manufacturing technology currently operating in space and the extended structure manufacturing and robotic system hardware demonstrated in thermal vacuum chambers simulating the LEO environment. Rush added that, due to the volume and mass efficiencies of manufacturing the structure, a small satellite such as a 150 kg ESPA-class satellite could be deployed with 5 kW of power. Today, that kind of power is only available on 1,000+ kg satellite buses launching on rockets costing tens of millions of dollars. The company continues to develop these technologies, planning more complex thermal vacuum and laboratory tests focusing on more complex and autonomous manufacturing and assembly operations. As the Archinaut system uses in space manufacturing and robotics, the same core technology will be useful for a range of spacecraft missions and can also be used for a range of impactful applications beyond power systems, such as creating large apertures or spacing out sensors from one another. To learn more about the innovative technologies that are driving the satellite and space industry to new realizations and bright futures, attend the upcoming Satellite Innovation event, which will be in session at The Computer History Museum in Mountain View, California, from October 8 through 11. To learn more, head over to satinnovation.com.